I hope I am in time for Click! Probably in the nick of time. But I cannot miss it. I had taken a few shots before I left Germany for Dubai and was rather pleased with all of them. But I decided to select this one for my entry to Click - Metal, which is the current theme. Metal is a rather cold material. I wanted to portray it in a warm light. Not easy but achievable with the right lighting, colors and backdrops. I have a wonderful matt metal bowl, that I love and it was perfect for this shot. Food had to be a part of the shot. After all food is what this blog is all about. 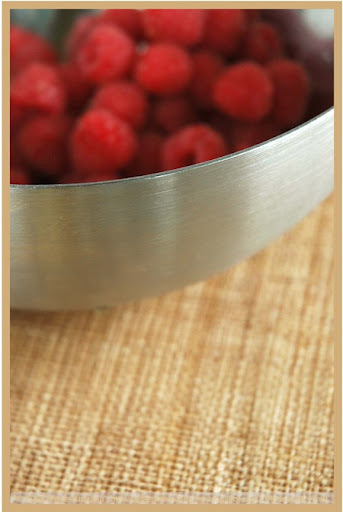 I used some fresh raspberries as I love the warm, pink and red shades, which is always eye-catching. My background is a soothing burlap placemat. These colors reflect against the metal and create a wonderful effect. Important Note: For those of you who come on over to What's For Lunch, Honey? from Taste of India, there seems to be a little hitch there. For some reason TOI is not updating certain feeds and unfortunately my blog is also effected. Sailu is trying to fix the bug, in the meantime if you would like to keep yourself updated with the posts here, you can subscribe to WFLH using another service. Check my sidebar and select your favorite subscribing service. Now time for me to get back to my shopping - after all I am in the shopping paradise of Dubai! how is Dubai?? I've always wanted to visit, but haven't gotten around to it. I hope you have a great trip! ps. nice photo! very warm indeed. You are busily posting from Dubai. I always adore the colors in yr photos. Same goes here. Rgding TOI, my feeds are not updating too. Definitely looks all warm and fuzzy. Nice capture, Meeta! The photo is terrific Meeta but your commentary is wonderful. I really like hearing how and what you were aiming for! I hope you are enjoying your trip! The metal is wonderfully captured! Hope you are having a blast in Dubai Meeta...thats one place I always wanted to visit. The pic is very well taken with emphasis on the 'METAL' theme. Ur photos are always a treat to eyes. Great blog. The photos are beautiful! Hats off you to still blog when on a holiday ! I was going to say - you've managed to make chrome look soft, which is no mean feat. I love your photographs. Enjoy Dubai! You are the winner of March IFP!! Dubai was great. I appreciate all your comments. Thanks folks!